Chinese sprinter Xie Zhenye dashed to a 9.97-second winning mark in the men's 100-meter event at the Meeting de Montreuil on Tuesday, cutting 0.07s off his personal best while breaking the national record by 0.02s. The 24-year-old Xie, the 200m gold medalist at the 2010 Youth Olympics and a two-time 60m fourth finisher at the IAAF World Indoor Championships, outraced Akani Simbine of South Africa to notch his landmark victory with a 0.9m/s tailwind. Simbine finished second in 10.04s, followed by Paul Camilo De Oliveira of Brazil in 10.10s. 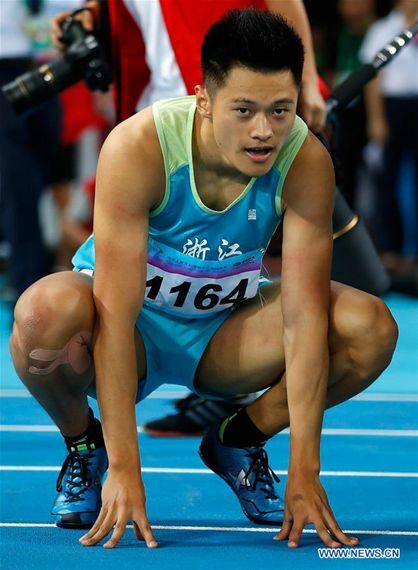 Xie's previous career best was achieved last year at the Chinese National Games when he registered a winning time of 10.04s. He also beat the national record of 9.99s, set by the country's star sprinter Su Bingtian at the Eugene leg of the 2015 Diamond League, and has become the second Chinese to dip under the 10-second barrier. Xie also set the 200m national record last month in Japan. Now he has both the 100m and 200m national record to his name.